Child 44, the latest film from Director Daniel Espinosa, should be a taut thriller with a solid cast, but in actuality, it’s kind of a mess. The film, based on the novel by Tom Rob Smith, follows Leo (Tom Hardy), a Soviet war hero who goes to work for the precursor to the KGB. His job is to root out traitors to the Motherland and he is very good at his job. He is married to Raisa (Noomi Rapace), but their marriage isn’t all it appears to be. One day, it is reported that the son of his friend Alexei (Fares Fares) has been killed. The boy has been murdered, but the Soviets try to sweep it under the rug as an accident, because murder is a “capitalist disease.” So, it falls to Leo to make Alexei and his family accept the official, but false, report. It is then revealed that Raisa is a spy, or at least the government believes her to be. Leo will not denounce her, so the two are shipped off to Volsk and stripped of their status. In Volsk, Leo serves in the militia under General Nesterov (Gary Oldman). When another boy turns up dead in the same manner as Alexei’s son, Leo convinces Nesterov to work with him to solve the crime despite the government’s efforts to bury the truth. Now, all of that sounds great, but the problem with the film is that the focus is all over the place. A lot of time is spent on Leo and Raisa’s marriage, which has conflict, but an unsatisfying resolution. A ton of time is spent on Leo’s professional rival, Vasili (Joel Kinnaman), who was Leo’s subordinate, but then takes his job when Leo is disgraced. In fact, the Vasili plot becomes more important than the child murder plot, which begs the question, why is this movie called Child 44? There’s just too much going on, which is fine for a novel, but the story isn’t streamlined nearly enough for a film. The lack of a main focus leads to unsatisfying conclusions all the way around with the film’s climactic battle ending quite anticlimactically. Also, let’s talk about action scenes and shaky cam for a moment. Some films, like the Bourne movies, which kind of invented the technique, do it well, while Child 44 is so inept, the shaky cam left me nauseous with no idea what was happening in the action scenes. I didn’t know who was fighting whom or what the hell was going on. It was a complete mess. The cast does a decent job with the material. Hardy is good as always, though it was strange how he was off the only non-Russians to do an effective accent. Oldman is good in the scenes he’s in, but he is criminally underused. Kinnaman is suitably creepy as Vasili, crafting a truly despicable villain. Even Noomi Rapace, whom I usually can’t stand in English-speaking films, does a good job, but the script just doesn’t do any of them any favors. Overall, Child 44 takes a stellar cast and delivers a huge disappointment. Parts of the story didn’t mesh well and left me confused at times. It’s just a poor adaptation, which is a shame because it had a lot of potential. Skip it. 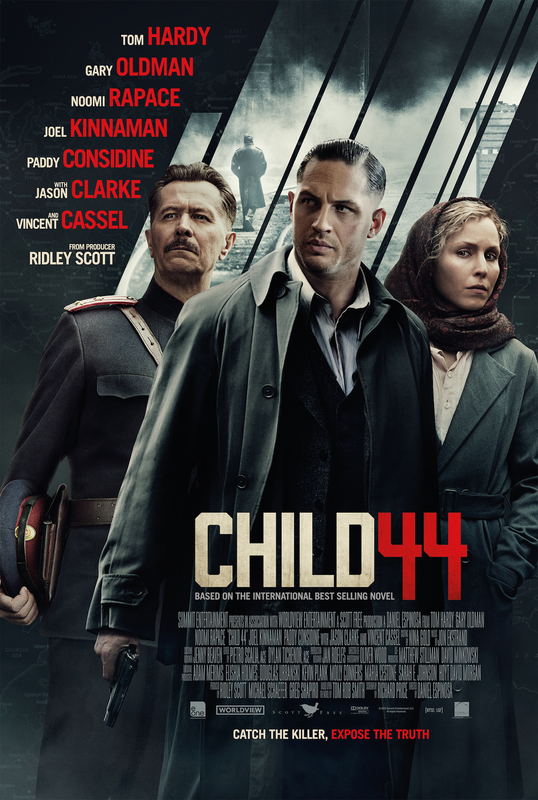 This entry was posted in Reviews and tagged adaptation, Child 44, Film Reviews, Films, Gary Oldman, Hodgepodge, Joel Kinnaman, Movie Reviews, Movies, Noomi Rapace, Podcast, Tom Hardy. Bookmark the permalink.